Jack Huston, Toby Kebbell and Morgan Freeman star in Ben-Hur, a new adaptation of Lew Wallace’s 1880 novel Ben-Hur: A Tale Of The Christ. The influential book paved the way for three films including MGM’s 1959 classic starring Charlton Heston. A falsely accused nobleman survives years of slavery to take vengeance on his best friend who betrayed him. 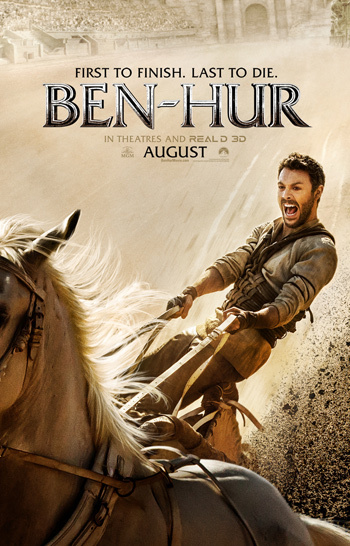 “Ben-Hur” tells the story of Judah Ben-Hur, a wealthy prince of Jerusalem who crosses the wrong powerful people and ends up plunged into a lifelong ordeal of slavery, poverty, revenge, redemption, and — of course — chariot racing. Directed by Timur Bekmambetov (Wanted), the project is being spearheaded by Mark Burnett and Roma Downey, the filmmakers behind the critically acclaimed “The Bible” miniseries on The History Channel. Oscar-winning “12 Years A Slave” scribe John Ridley wrote the last draft.